George Berkeley Research Papers look at this irish philosophers argument on immaterialism. Does matter really exist, or is it simply a function and a creation of our minds? George Berkeley, the Irish philosopher and church bishop, argued that whatever we perceive as real is actually perception, that which we want to see. In this paper, we will examine this philosophy which, though not unique (Descartes and others also held it), was perhaps the most in-depth look at the existence or non-existence of the real world. Perhaps fittingly, Berkeley’s life span almost exactly paralleled those of Johann Sebastian Bach and George Frederick Handel. Berkeley lived from 1685 to 1753; Bach lived from 1685 to 1750, and Handel lived from 1685 to 1758. All contributed – though in different ways – to our knowledge and understanding. Berkeley was trained in philosophy at Trinity College in Dublin, though he also had a profound interest in mathematics. 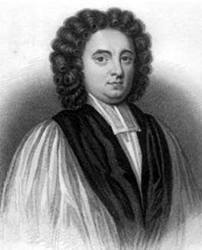 He was ordained a priest in the Anglican Church in 1710 and traveled to Bermuda with his wife in 1724, to found a college for Christian education. He eventually settled in Rhode Island in 1728 with his wife, where he struck up a correspondence with American philosopher Samuel Johnson. Because the funds he had been promised by Parliament for the founding of the college never came through, Berkeley returned to England in 1732 In 1734, became a bishop (in 1734). It was shortly after his consecration as bishop that Berkeley published The Analyst, which was an attack on higher mathematics as leading to free-thinking. Beginning in 1744, Berkeley delved into the metaphysical natures of the physical and spiritual universe, as well as into the nature of God. That same year, he published Siris, in conjunction with his metaphysical philosophy. Berkeley continued this work for the next 10 years, though he experienced a great tragedy in 1751, when his oldest son died. He moved with his wife to Oxford, where another son was studying and remained there until his sudden death in 1753 (while his wife was reading to him from the Bible. The basic tenet in George Berkeley’s philosophy was that an idea, whether of reflection or sensation, is the content of an experience. Thus, an idea of sensation is the content of an experience of hearing, touching, or seeing, whereas an idea of reflection is a thought or mental image. To Berkeley, the actual viewing of something and developing a mental image of it were two disparate items. For example, if a person is reading a newspaper, that is a visual experience. If that person closes his eyes and tries to imagine the page he has just read, then that becomes reflection. To be sure, Berkelian philosophy is not an easy one to understand. In fact, it requires us to reorient our “normal” thinking regarding objects. Paper Masters writes custom research papers on George Berkeley and look at this irish philosophers argument on immaterialism.